Hi and Happy Thursday. Hope you are having a great last day of July! Today is unusually cool and will be rainy. Odd for July weather. It’s normally hot, humid and very dry, but not this year. 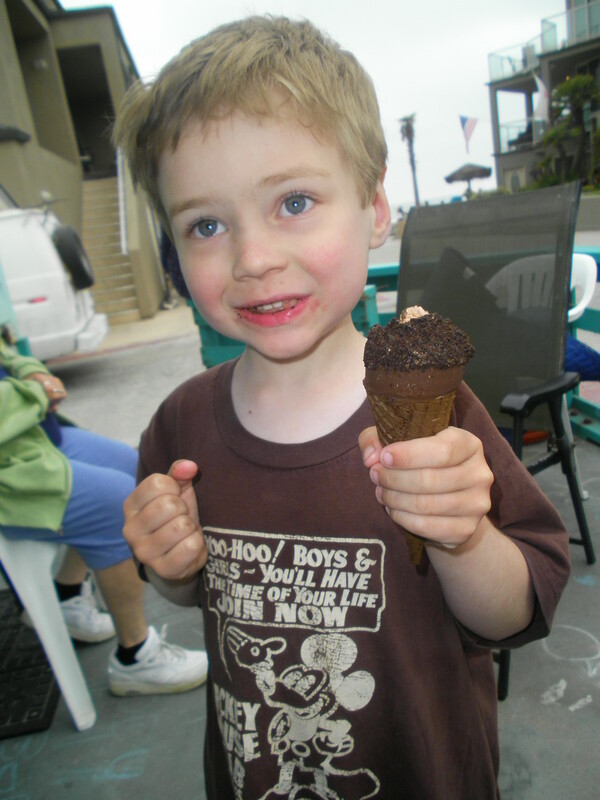 For today’s picture, I decided on a photo of Ian from 2009, when he wasn’t quite two years old. This was his second trip to San Diego. This photo is of my little sea monster coming out of the bay. Some friends of ours let us borrow the wet suit, which was way too big. 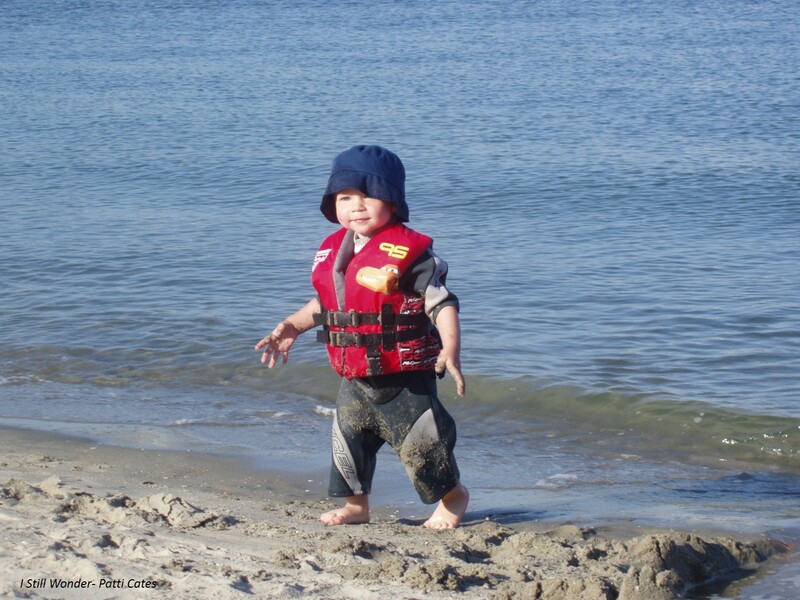 And, we had the life jacket on top to help him while in the water. He had a hard time moving around but still had fun. He has grown a lot since then and is now more comfortable in the water. He loves to swim in pools and likes getting his feet wet in the ocean. Next time we are in San Diego, we will have to try this bay again. It is so nice and calm for swimming. This coming weekend we look forward to time to swim and more time to relax. Should be a fun one, but then again, I think it’s supposed to be raining. Oh well, we can figure out what to do inside. I wonder what other fun adventures this week will bring? I can’t wait to find out. Have a great one! Happy Thursday! For today’s Throwback Thursday, I decided to go way, way back. 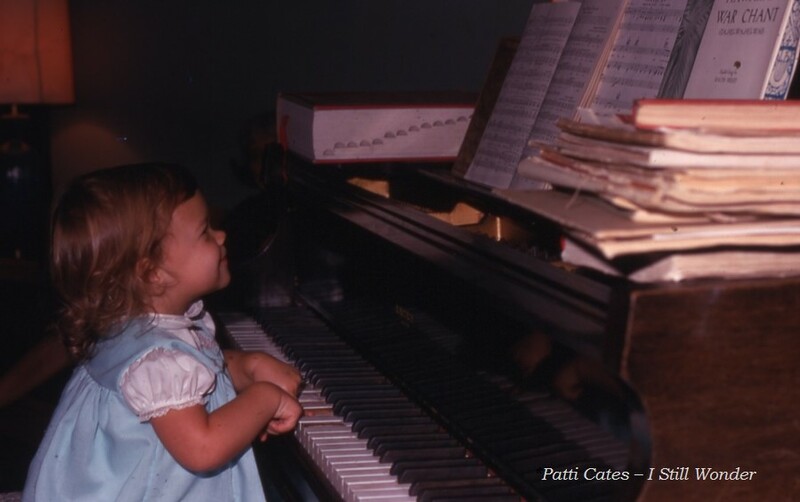 This is a picture of me as a little girl trying to play the piano at my grandparent’s house. Now, my husband and I have a piano and although I still love to play, I still don’t practice nearly enough. This is something I need to work on. Any suggestions? I know a few people who are amazing pianists. My aunt can play almost anything from memory. She was always the one who played my favorite songs during our family singalongs. My sister-in-law and her mother all also very good as are my niece and nephew. They have all learned well and practice regularly. I also have a cousin who is an amazing pianist and singer. She has written several songs and my favorites are the ones with her singing as she plays the piano. And, there are artists/musicians who I like very much who are very good on the piano — like Jim Brickman, Elton John, Paul McCartney, Billy Joel, John Legend, Norah Jones, Michael Feinstein, Bruno Mars, Christina Perri, Sara Bareilles, Josh Groban, Diana Krall, Lady Gaga, Alicia Keys, Jerry Lee Lewis, and Ray Charles. Who would you add to this list? My goal for the month of August is to practice more and to learn a new song. I enjoy it very much and it is relaxing. Just have to add it to my schedule. I wonder what will be the next song I will learn? I think “How Great Thou Art” will be my choice. I have worked on it before and look forward to doing so again!! I will keep you posted on my progress. Earlier this week, one of the Hallmark Channels aired a movie entitled, “The Magic of Ordinary Days.” It is a drama set during World War II when the world was a very different place. I have seen the movie and enjoyed it. However, hearing and reading the title inspired me to write since I think there is magic in ordinary days. Ordinary is defined as the regular or customary condition or course of things. It often gets a bad rap since things are “supposed” to be unique, or special or amazing. But, in the midst of storms of life, the ordinary is comforting. We are creatures of habit and routine and that is what ordinary days are to me. The comfort of knowing what to expect is nice. Don’t get me wrong, I do like excitement and new and exciting things, but I am basic person and happy with ordinary things. The people in my life are not ordinary but extraordinary. They enrich my life and bring me happiness. To be with them is special and fun. I am truly thankful for both the ordinary and extraordinary. I wonder what today will bring? I can’t wait to find out. Some weeks are good weeks and some are not so good. We can call them the storms of our life. I have had one of those weeks. On Sunday, a friend passed away. She was young and has a son Ian’s age. 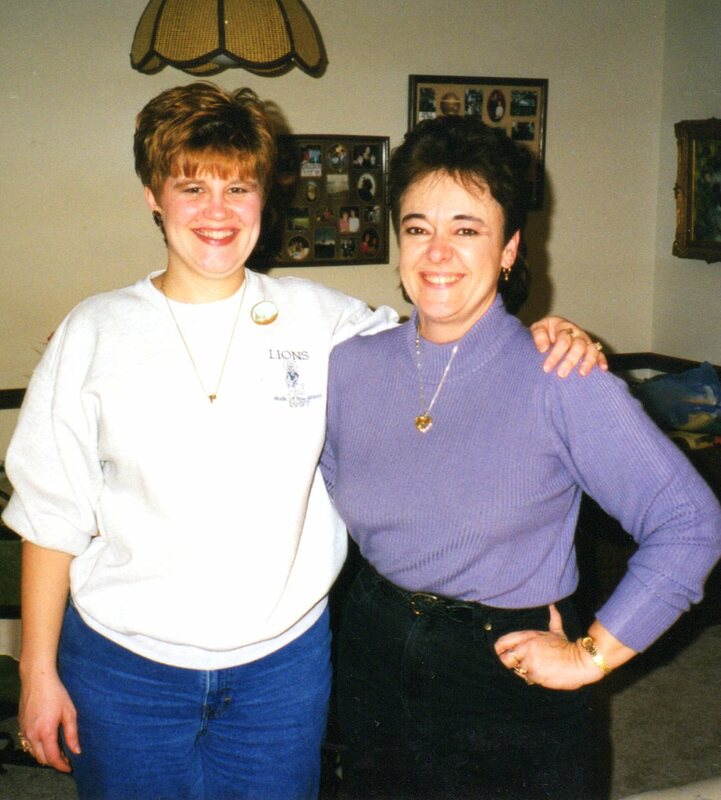 She was someone who I am very glad to have had as my friend. We didn’t know each other for that long but we clicked from the first time we chatted as our boys played together. On Thursday, we celebrated her life at a lovely memorial service. She had requested everyone to wear bright colors and it was such a lovely vision to see. Instead of the usual black, there was a sea of pink, blue, yellow, green, orange, and many other colors. Despite the sadness, if made me smile. The music was lovely and the scripture verses very meaningful. It was a lovely tribute to this fine woman. I continue to pray for her husband, child, and family. Also this week, one of my relatives had surgery after going through months and months of chemo. She has been brave and amazingly strong through it all. She is home now and continuing to get better! What a fabulous answer to our prayers. We continue to pray for her each and every day. On the good side of things, I found out that one of my cousins is pregnant with her second daughter. We are so excited for this new life and cannot wait to meet her. I hope and pray for a great rest of her pregnancy. With the end of one life, the struggles of another life, and a new life on the horizon, I am reminded of how precious and short our time is. And how life keeps going and moving on. And how precious the loved ones who enrich my life truly are to me. I try to remember to make the most of each and every minute that I have and spend time with my loved ones. But, I have to admit, I sometimes take these people for granted, without meaning to. I want to be sure not to do that, but instead remember to savor and appreciate them and be in the moment. I don’t plan to beat myself up for missed moments, but instead learn to realize how truly each minute is a gift and to be treasured. Also on my mind this week are the many struggles and suffering all over the world — fighting and violence, the airplane that was shot down, and the terrible fires, flooding and other strong storms. I continue to pray for those affected by all of these disasters. The photo at the top of the blog is one that I took of an approaching storm during our recent trip to Charleston, SC. It was lovely yet menacing. Very soon afterwards, the storm clouds opened and a soaking rain started. Thankfully we were in my cousin’s truck but the rain was so heavy that it was hard to see. It didn’t last very long and then the sun came out. Thankfully, just as that rain storm moved out quickly, the storms in our lives eventually still and move out. And, then there is the rainbow or the sunny day. So too, the hard times will eventually turn into easier times. I hope and pray that will be soon for those suffering. This weekend is a rainy weekend and one that is quite unusual for July. It is cooler than normal with a steady rain for most of today and tomorrow. May we enjoy our time and appreciate the rain. After all, it will be lovely once the sun comes back out. I wonder if I can appreciate each day, even one with storms and struggles. With the Lord’s help and love and strength of my family and friends, I will do my best. Hi and Happy Thursday! It is time for another Throwback Thursday. My, the week has gone fast. I was looking through some old photos recently and came across this one. 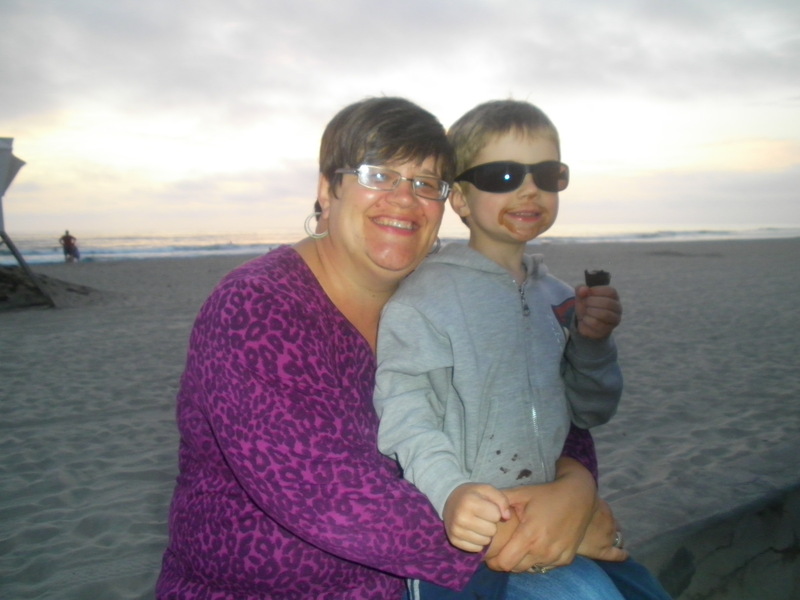 It is from a few years ago at our favorite beach. I thought it would be great for today. 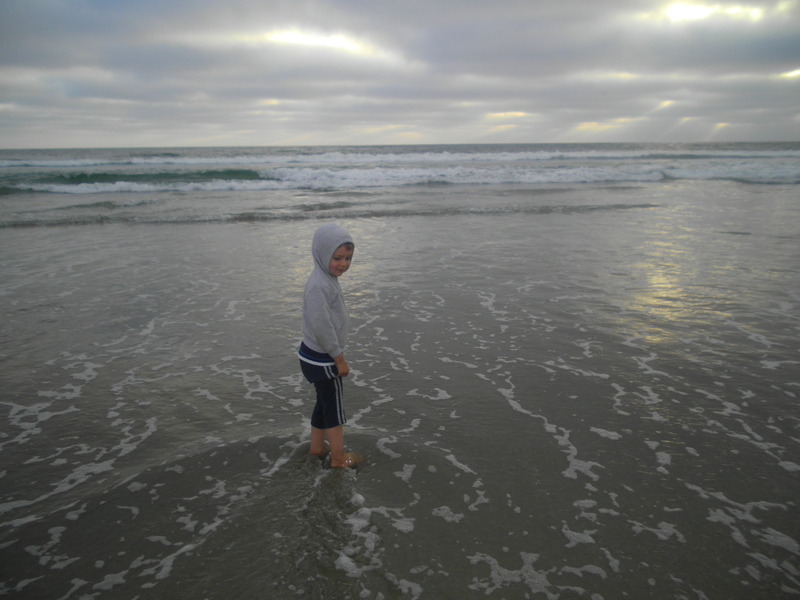 I like this picture of Ian getting his feet wet at sunset time. It was a very cloudy evening yet still lovely. 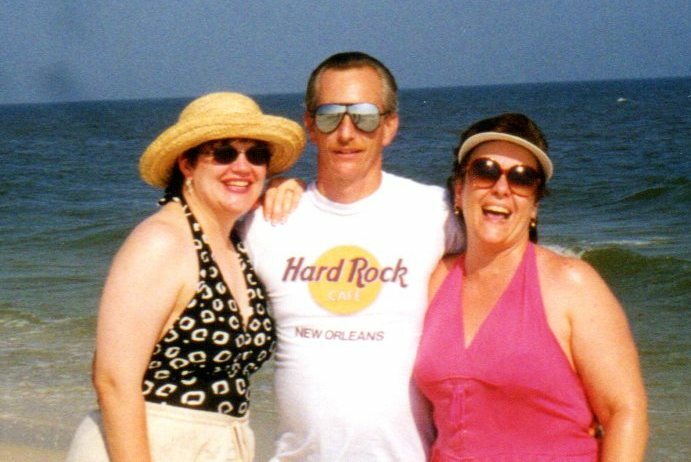 Some of my family is having fun at this beach, but we weren’t able to make it this year. Instead we are doing other fun activities. I do love the ocean and am enjoying their amazing pictures from this summer. I am also enjoying mine from a few summers ago. 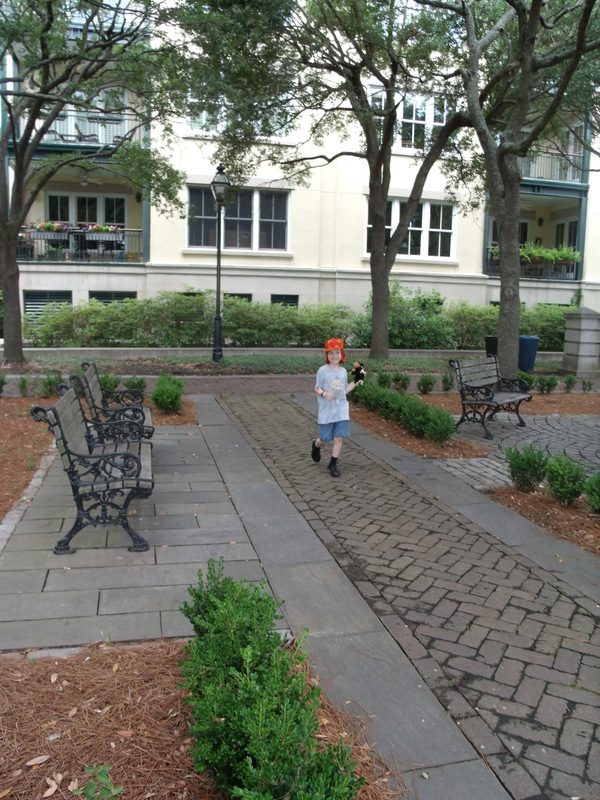 As I wrote about recently, we went to Charleston and got to see that coast at the harbor. It is equally lovely and was a great trip seeing family. We had a chance to go swimming as well. It has been a good summer so far. That will be a fun trip to a favorite city’s downtown street. There is much to see and do and it is something to look forward to. We should be able to do that this weekend. Downtown includes a great toy store, a general store, a wonderful bakery, a few used bookstores and a frozen yogurt shop. There are also a variety of great restaurants and coffee shops. I wonder when I will be at the beach again? I hope that it is soon, but in the meantime, I will enjoy other bodies of water and make the most of the time and places that I find myself in. Have a great day! July is National Ice Cream Month. I just found this out and had to write about it. According to a Web site, “In 1984, President Ronald Reagan designated July as National Ice Cream Month and the third Sunday of the month as National Ice Cream Day. Isn’t that cool? (Pun intended) I had forgotten that he made this designation. I just wonder what events we should do to celebrate? I don’t know about you but I love ice cream. My favorite flavor is chocolate mint (aka mint chocolate chip). That is second only to chocolate chip. I also like vanilla ice cream with fresh strawberries. Those are my favorites. I like my ice cream in a bowl, but prefer it on a cone. What is your favorite and how do you like it? Many nights when we were there, we purchased treats from the ice cream truck – or my parents did. 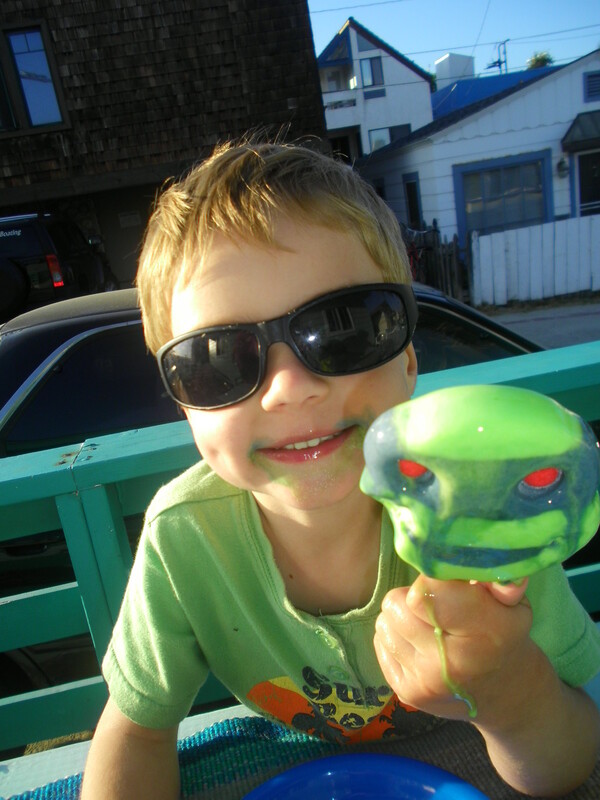 That summer we bought so much that the ice cream man gave Ian a freebie — the green and dripping face. Ian was thrilled and I was pleasantly surprised. What a nice thing for him to do. I am going to mark my calendar on July 20 for National Ice Cream Day. Cones, check. Ice cream scoop. Check. Large carton of mint chocolate chip as well as peanut butter and chocolate (which Kirk prefers). Still need to purchase. So better get on this, check. I just wonder what special “appropriate activities” we should do? Perhaps a build-your-own sundae? Or some large cones? I can’t wait to figure it out. In honor of my husband’s birthday tomorrow, I decided to include a few old pictures of the two of us and of us with Ian. 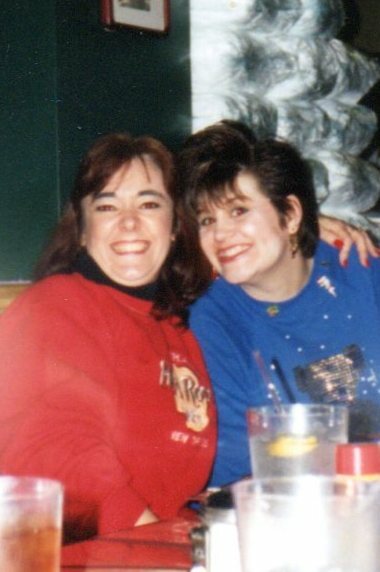 This first one is of the two of us in 2006 – pre-Ian. 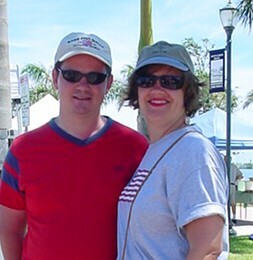 We were in Fort Pierce, Florida. 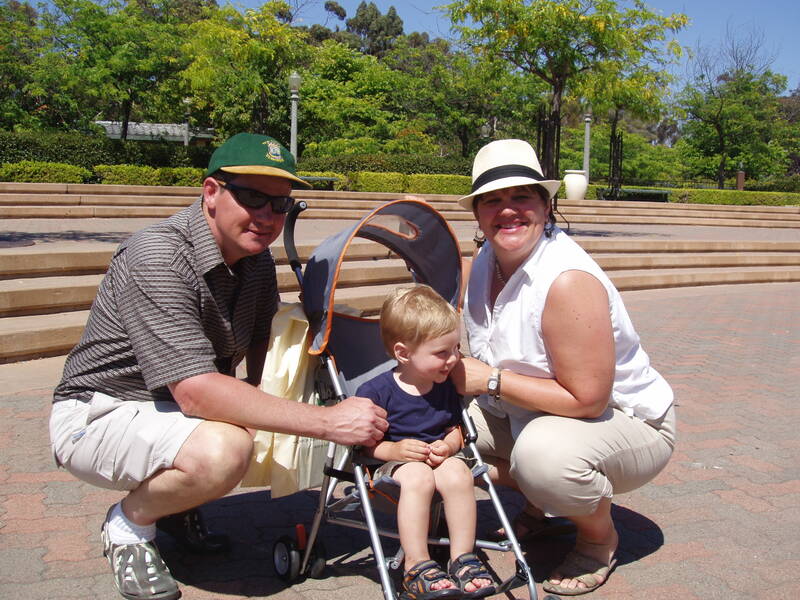 The second picture of us kneeling with Ian was taken in San Diego at Balboa near the organ pavilion. I don’t remember the year. As you can see we like hats and sunglasses when we are outside. 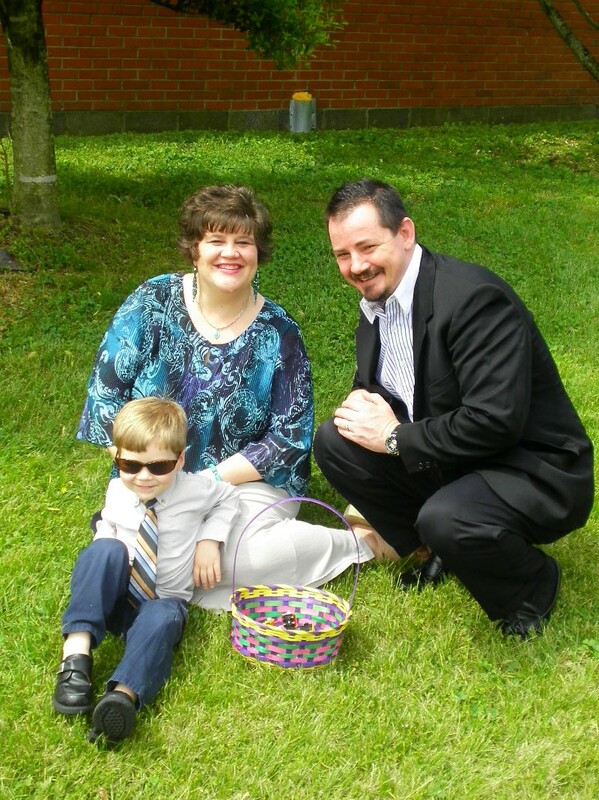 The third picture of us sitting on the grass was taken on Easter Sunday a few years ago. I just love Ian’s pose. He is a ham for the camera and certainly was in this picture. Happy early birthday babe! I love you very much! In the movie, Steel Magnolias, sweet tea is named the house wine of the south. I have to agree. Here in the south, most of us like our tea sweet with plenty of ice. Some like lemon with it and some don’t. Other parts of the country look at you funny when you order sweet tea or iced tea at a restaurant. In my opinion, the best sweet tea is when the sugar is added when the water is still hot — just after brewing. If you wait until it’s cold, it just doesn’t mix very well. My friend Dawn really likes sweet tea and regularly drinks it. My husband does as well. I like my sweet tea mixed with some unsweet tea as it is often too sweet for me. And, I like lots of ice. Imagine my delight when I realized that the town of Summerville, South Carolina, which we recently visited, is the birthplace of Sweet Tea. I made a note to be sure and tell Dawn about this. “For some years, the Southern beverage was thought to have happened onto the scene in St. Louis at The World’s Fair in 1904. 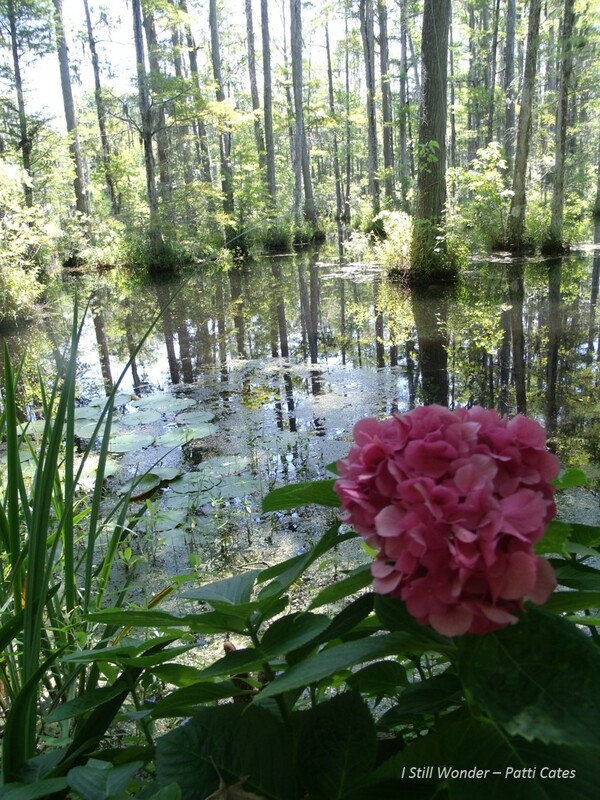 “But those ideas changed with the discovery of a long list of items purchased for a reunion of old soldiers near Summerville in 1890. 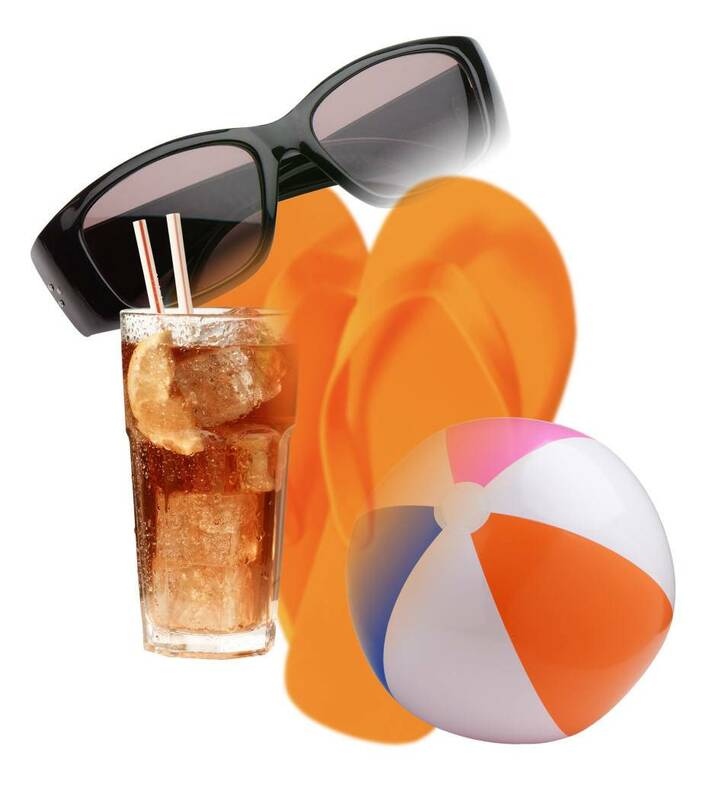 There is nothing like a glass of sweet tea – served over lots of ice — especially in the summer. AHHH! I wonder when my next glass of sweet tea will be? Probably at lunch! Take care and have a great day!